Choice Pharmacy offers a large range of services to the local community to aid in health awareness, prevention and treatment. Our aim is to provide an easy and informative experience for our customers, providing them with a large dispensary, weekly medication delivery as well as health checks and assessments. We offer a full range dispensary In order to meet all of our customers health and wellness needs. Come in and speak to one of our amazing pharmacists or fill out the form below regarding any medication enquiries. To make the choice pharmacy experience seamless we offer a weekly medication delivery service to local residents. This ensures our customers can always have access to their medications. Maintain a healthy blood pressure is essential to maintaining a healthy lifestyle. Drop in to Choice Pharmacy without an appointment and speak to one of our pharmacists who will be happy to answer your questions. Choice Pharmacy is a National Diabetes Services Scheme (NDSS) pharmacy. The Australian Government introduced the NDSS to provide greater information services and free or subsided government approved products and medication. Choice pharmacy has been a leader in servicing a large and varied range of aged care facilities from high and low care facilities, to retirement villages. Choice has developed a best practice in house model complimented with Webster care. Choice pharmacy offers many services for aged care facilities such as personalised profiles for each resident, daily deliveries, medication management reviews and are more than happy to provide any additional support. 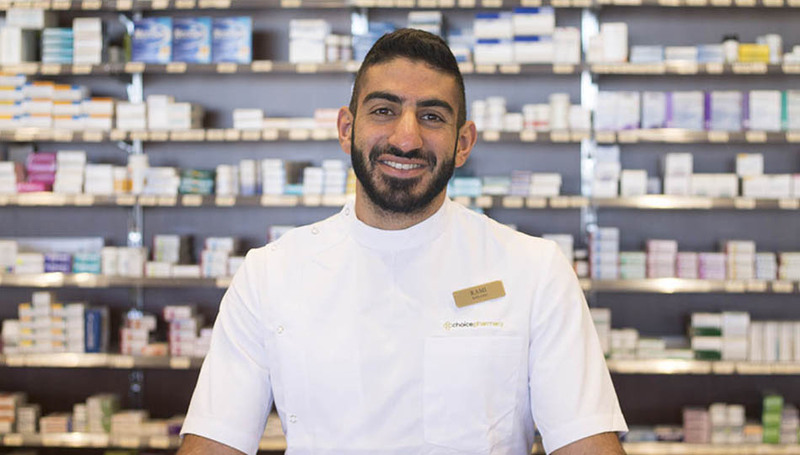 Want to speak to one of our highly trained pharmacists? Click one of the options below. Choice Pharmacy experienced pharmacists have many years of experience and are always on hand to help you with your needs. Our team is committed to providing nothing less than the best advice, suggestions and service whilst your visit our stores or over the phone for your convenience. Come in and speak to one of our amazing pharmacists regarding any concerns on your health and wellbeing. Our friendly team can help with treatment options and advice based on your symptoms. Choice pharmacy also offer additional pharmacy services including ear piercing and documents certification. Come in store and speak to one of our friendly pharmacists regarding these services. Choice pharmacy performs ear piercing for adults, children and babies under strict hygienic conditions using the highest quality ear piercing earings. Need a passport or ID photo? Visit Choice pharmacy! We provide fast and convenient passport-quality photos. Selected stores only - Not Valid in Bakewell.